Here's this week's column from the Weekly. 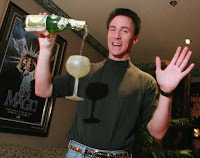 To hear more discussion of Gill's comments -- including the surprising show Gill believes to be among the most successful in town -- grab this week's episode of "The Strip," which also features a chat with Lance Burton as the magician prepares to return to work Friday at the Monte Carlo. Listen here or right-click here to download the file to hear whenever you want. It’s not as though this ought to come as much of a surprise, I know. We all saw “Avenue Q” come and go, “Hairspray” come and go, “The Producers” come and go. We saw “Phantom: The Las Vegas Spectacular” cut back from 10 shows a week to eight. We knew that “Mamma Mia!” is in its final throes, even as it this month celebrated its fifth birthday, impressive by any Vegas measure. And we’ve all heard the rumors that “Spamalot” isn’t long for this street. But that, my friends, is a far cry from the declaration made by the man most responsible for this decade's Broadway wave in Las Vegas, Michael Gill. He’s the man with his finger most firmly on the pulse of the Vegas entertainment scene and he’s calling the body. "If there ever was a Broadway West phenomenon, it’s done,” Gill told me this week. “Jersey Boys will be very successful. But that’s an anomaly and that's it. No casino I know is looking to bring another Broadway show here." What DO They Do With the Fountain Change? • MGM Mirage says they allow each resort to pick a charity to give the money to. I’m trying to get a list and an estimate on how much they give and I may be able to report that on the blog or on next week’s show. • Harrah’s says they give it to their employee-controlled assistance fund which grants or loans money to employees when they have personal emergencies. • The Las Vegas Sands folks said they give it to the Venetian Charitable Foundation, whatever that is. 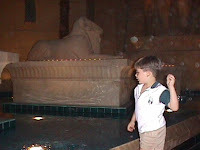 We remove the coins thrown into the water features periodically. They get hard water deposits on them and the banks won’t take them in this condition. We have tried everything under the sun to clean them and haven’t found anything that works. The intention would be to give them to charity, but they cannot use them in this condition either. Last time I checked we had several 5 gallon buckets full of coins that we cannot use. That's a fascinating thing on two fronts. First, it makes a certain amount of sense and it makes me wonder if the other properties are fibbing. 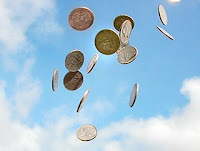 Secondly, I would LOVE to see these buckets of coins. Anyone out there have any idea what they could do to make this money worth something again? Sorry, Alanis Morissette fans. You oughta know you'll have to wait a couple weeks to hear her. I'm chatting with Lance Burton as he prepares to return to work at the charred Monte Carlo. And I've got one hand in my pocket for next week's show, even though I have no idea what that means. Isn't that ironic? ANYHOW, join us at 7 pm PT for the live show at LVROCKS.Com. Hear all the funny outtakes! Chat with fellow fans! Drink when Miles cusses! Or don't and you'll get the episode Thursday on the podcast feed. Your call. Weird Thing No. 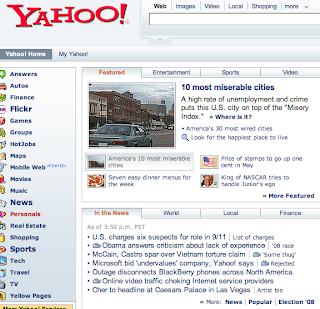 1: I found it really kind off weird that on the home page of Yahoo! today, five days after the formal announcement of Cher's Vegas adventures, the seventh headline under "In The News as of 3:50 pm PST" was, uh, "Cher To Headline At Caesars Palace in Las Vegas." Weird Thing No. 2: I appeared today on KNPR's State of Nevada to discuss my Vegas paparazzi piece from The New York Times. Most of the hour was taken up by a discussion among concerned parties about some controversial development in the northern part of the valley. But on the KNPR website, the description of their show makes it sound like I believe that celebrities are finding safe haven in the Upper Las Vegas Wash, doesn't it? Oh, and if you want to hear my part, I just put the file into our podcast feed. You can click here to hear it or right-click here to save it. It's about 8 minutes long. I've never seen a trailer for a book before. Ever. But check this out, for a book called "Double Or Nothing" by Tom Breitling, half of the Tim-and-Tom duo from the Golden Nugget. I got a peculiar press release just now proclaiming that Zagat has named the gargantuan Bass Pro Shops at the Silverton as the No. 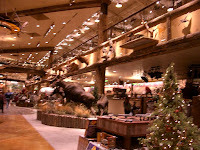 1 men's and womens' wear store in Las Vegas in its 2008 guide. Really? I know Zagat's method is democratic, but does that even make any sense? This place is dominated by a very specific type of merchandise and I don't think people even THINK of it as a place to go buy clothing. According to the release, Zagat "notes the store's vast collection of hunting, camping and golfing equipment as well as full lines of outerwear for inclement weather." Huh? That doesn't sound like a clothing shop to me, at least not in the way that learning some place was named best women's and men's wear shop in the city would imply to me. It also doesn't sound particularly useful to most people either living or visiting Las Vegas, where inclement weather means it's drizzling. Don't get me wrong. It's a cool store. I'm just baffled by this categorization. Does it compete in this category with Nordstrom, Barney's and Saks? Wouldn't this be like giving this honor to Bed, Bath and Beyond for their apron selection? * Another Casino Brigadoon Coming Soon: The R-J's Inside Gaming column reports that the owners of the plot of land at the Strip and Sahara Ave where the late, great Holy Cow stood is getting its approvals to have a Trailer Station, an 8-hour casino to maintain the gaming zoning on the land, some time in March. Fun, but I'm glad I did the piece in January; setting up a trailer in a massive, vacant parking lot is so much more interesting to look at and read about than turning on some slots in an existing building. I may go, though, if only to see if I can repeat my 150 percent winnings from the last time. * Cindy Adams May Be Right. Or something. Howard Stutz reported in the R-J on Saturday that Las Vegas Sands is buying a pair of new jets to retrofit with baccarat tables for Asian whales. Stutz writes that LVS brass have approached the Nevada Gaming Control Board about the legality and tax issues involved with gambling revenue while aloft. Cindy Adams, in that piece I mercilessly picked apart, mentioned something about this, though of course she had the details a bit off. Maybe they'll their airborne casinos "Phoenicians," eh? * Utter, Utter Heartbreak. Just read this and, yes, weep. The bride dropped dead during the couple's first dance. Wow. * Utter, Utter Stupidity. My "Petcast" colleague Emily Richmond had a shocking piece in the Las Vegas Sun a week ago on the notion of the "minimum F" in Clark County schools. That is, there are schools where teachers have to give students at least 50 points even if they don't do their work so as to avoid them becoming so hopelessly down in grades that there's no way they can pass. It is just an amazing tale, one I have every intention of ripping off for someone soon. * Bye Bye, Lovie. 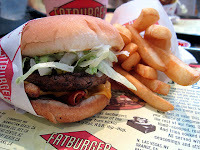 We do so love our Fatburger. Maybe not as much as those Grits To Glitz chicks, but yum! Too bad you have to take a gun into the area of Nellis and Vegas Valley that's nearest us to get us some. But, regardless, we were sorry to read that Lovie Yancey, the woman who invented the chain, has died. And, no, not of a heart attack. She had pneumonia. At 96. * You want to know why people love coming to Vegas? Sure, it's the entertainment and gambling and all that. But it's also because good customer service is generally the rule and not the exception. And that's what MGM Mirage knew when it handled those displaced by the Monte Carlo fire. I'm sure you've read as much as you want to about the fire by now, but this piece by Jennifer Robison is still worthwhile. OK. Enough being sick. Time for me to get back on my horse and get back to work. Listen for me at about 9:45 a.m. PT or 7:45 p.m. PT on Monday on KNPR (or via their site, knpr.org) discussing my NYT piece on the lily-livered Vegas celeb-media corps.